The cloud-based testing lab enables users to access real smartphones and tablets globally and across carriers for testing purposes. 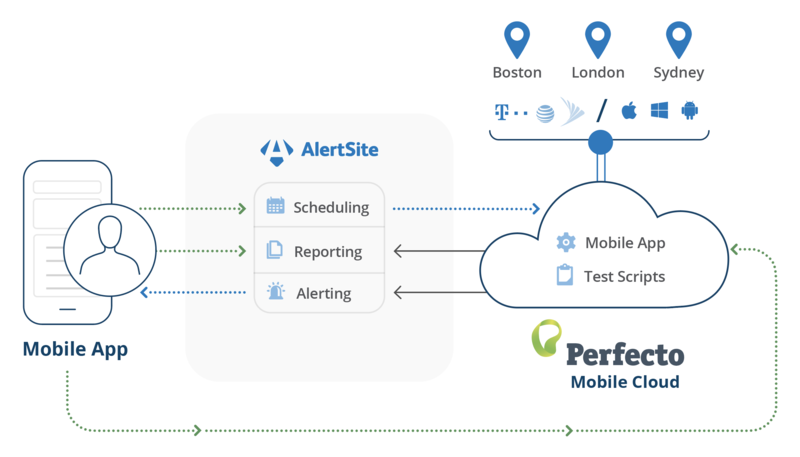 By integrating with AlertSite, you can monitor applications across real devices in the Perfecto Mobile cloud, using preexisting scripts. This allows development and operations to work together with a common tool and views. MobileCloud Monitoring enables cloud based monitoring of all mobile application types (web, native and hybrid) on real devices, integrating with leading industry solutions to accelerate resolution of performance impacting issues. Monitor select application transactions with a defined frequency on real devices and carrier networks. Monitoring on each logical device (“iPhone 5-Boston-AT&T”) is mirrored to a backup device. Deployment options enable perfect fit, supporting local functional and security requirements. Each monitoring execution results in a detailed rich media report, including steps, timers, device screenshots and videos. The report function supports persona-based reporting and dashboarding.